Welcome back to episode #304! Do you already have a team or are you thinking you don't need one yet? I know you're a go-getter, powerhouse female entrepreneur who can do “all the things,” but truth be told, in the end time is money. I can confidently say there is not one business owner who can say they do not need a team. We ALL need at least one person on our team! “I became obsessed with building my own team…” At minute 1:21, if you don't know who Theresa is, I'm letting her share her story and fill us in to how she got where she is now. 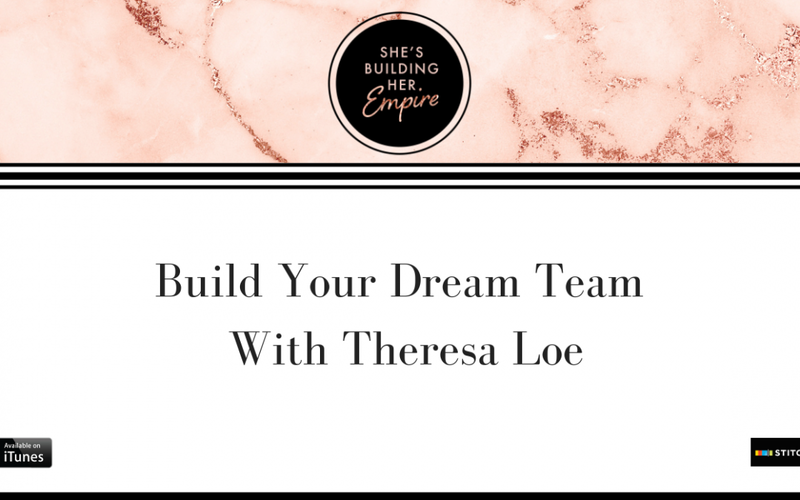 Theresa gives us some tips on how to become a visionary if you are a natural integrator and some things she did to make sure she knows she is in the right roll in her business. “You never hand out tasks, you hand out responsibilities…” At 9:15 I ask Theresa if it's possible for any company to run with one person and do it all on their own. She explains the 3 levels of entrepreneurship and tells us why we all need help sometimes! Plus, Theresa tells how us we can stay in our zone of genius by giving your team responsibilities. “They hire for skills instead of characteristics…” At minute 15:09, Theresa tells us some of the biggest mistakes people make when hiring a new team member. We also dive into training a new team member, why your business needs to have systems in place and how Theresa creates a new process. “Those are the first things that you hand off…” At 27:42 we talk about where someone should start if you are looking to hire your first team member. I gained so much business insight from this single podcast -I can’t believe it has taken this long to press “play”! I will definitely be listening to more! I love hearing that!! So glad you enjoyed this episode!